I think most of the caterpillars are in their 5th instar – the last one before they make a cocoon. Here’s a photo of one of the biggest ones. 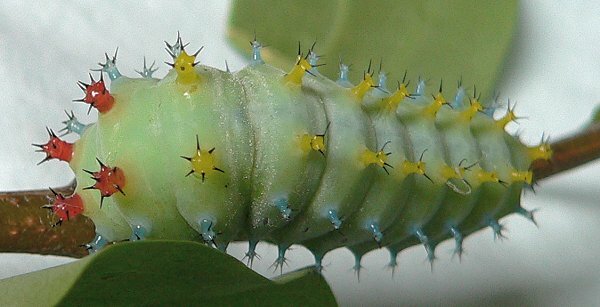 The earlier instars have red knobs and more spikes on the knobs. I think this one is a 4th instar. They should be almost ready to make their cocoons. Many of them are 3 inches long or even a little more. I’ve been giving away as many as I can but I still have 45.